We have opened this chapter with the stories of two countries, the Netherlands and Britain, in which the resistance of the private citizen to this new type of monarchy, the Machiavellian monarchy that was arising out of the moral collapse of Christendom, succeeded. But in France, Russia, in many parts of Germany and of Italy-Saxony and Tuscany e.g. 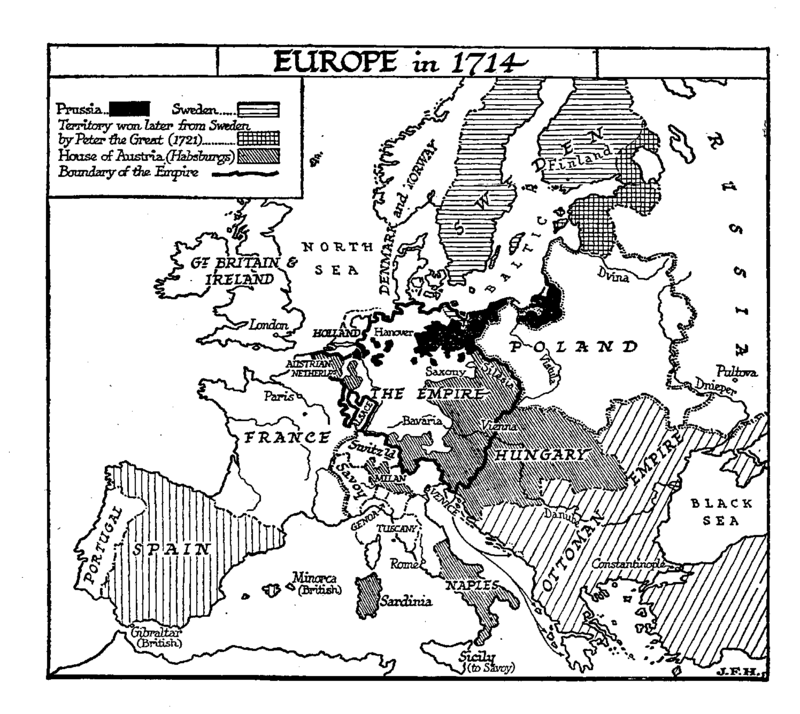 personal monarchy was not so restrained and overthrown; it established itself indeed as the ruling European system during the seventeenth and eighteenth centuries. And even, in Holland and Britain the monarchy was recovering power during the eighteenth century. In France there had been no Magna Carta, and there was not quite so definite and effective a tradition of parliamentary rule. There was the same opposition of interests between the crown on the one hand and the landlords and merchants on the other, but the latter had no recognized gathering place, and no dignified method of unity. They formed oppositions to the crown, they made leagues of resistance such was the «Fronde,» which was struggling against the young King Louis XIV and his great minister Mazarin, while Charles I was fighting for his life in England but ultimately (1652), after a civil war, they were conclusively defeated; and while in England after the establishment of the Hanoverians the House of Lords and their subservient Commons ruled the country, in France, on the contrary, after 1652, the court entirely dominated the aristocracy. Cardinal Mazarin was himself building upon a foundation that Cardinal Richelieu, the contemporary of King James I of England, had prepared for him. After the time of Mazarin we hear of no great French nobles unless they are at court as court servants and officials. They have been tamed but at a price, the price of throwing the burthen of taxation upon the voiceless mass of the common people. From many taxes both the clergy and the nobility—everyone indeed who bore a title—were exempt. In the end this injustice became intolerable, but for a while the French monarchy flourished like the Psalmist’s green bay tree. By the opening of the eighteenth century English writers are already calling attention to the misery of the French lower classes and the comparative prosperity, at that time, of the English poor. On such terms of unrighteousness what we may call «Grand Monarchy» established itself in France. Louis XIV, styled the Grand Monarque, reigned for the unparalleled length of seventy-two years (1643-1715), and set a pattern for all the kings of Europe. At first he was guided by his Machiavellian minister, Cardinal Mazarin; after the death of the Cardinal he himself in his own proper person became the ideal «Prince.» He was, within his limitations, an exceptionally capable king; his ambition was stronger than his baser passions, and he guided his country towards bankruptcy, through the complication of a spirited foreign policy, with an elaborate dignity that still extorts our admiration. His immediate desire was to consolidate and extend France to the Rhine and Pyrenees, and to absorb the Spanish Netherlands; his remoter view saw the French kings as the possible successors of Charlemagne in a recast Holy Roman Empire. He made bribery a state method almost more important than warfare. Charles II of England was in his pay, and so were most of the Polish nobility, presently to be described. His money, or rather the money of the tax-paying classes in France, went everywhere. But his prevailing occupation was splendor. His great palace at Versailles, with its salons, its corridors, its mirrors, its terraces and fountains and parks and prospects, was the envy and admiration of the world. He provoked a universal imitation. Every king and princelet in Europe was building his own Versailles as much beyond his means as his subjects and credits would permit. Everywhere the nobility rebuilt or extended their chateaux to the new pattern. A great industry of beautiful and elaborate fabrics and furnishings developed. The luxurious arts flourished everywhere; sculpture in alabaster, faience, gilt woodwork, metal work, stamped leather, much music, magnificent painting, beautiful printing and bindings, fine cookery, fine vintages. Amidst the mirrors and fine furniture went a strange race of «gentlemen» in vast powdered wigs, silks and laces, poised upon high red heels, supported by amazing canes; and still more wonderful «ladies,» under towers of Powdered hair and wearing vast expansions of silk and satin sustained on wire. Through it all postured the great Louis, the sun of his world, unaware of the meager and sulky and bitter faces that watched him from those lower darknesses to which his sunshine did not penetrate. We cannot give here at any length the story of the wars and doings of this monarch. In many ways Voltaire’s Siècle de ouis XIV is still the best and most wholesome account. He created a French navy fit to face the English and Dutch, a very considerable achievement. But because his intelligence did not rise above the lure of that Fata Morgana, that crack in the political wits of Europe, the dream of a world-wide Holy Roman Empire, he drifted in his later years to the propitiation of the Papacy, which had hitherto been hostile to him. He set himself against those spirits of independence and disunion, the Protestant princes, and he made war against Protestantism in France. Great numbers of his most sober and valuable subjects were driven abroad by his religious persecutions, taking arts and industries with them. The English silk manufacture, for instance, was founded by French Protestants. Under his rule were carried out the «dragonnades,» a peculiarly malignant and effectual form of persecution. Rough soldiers were quartered in the houses of the Protestants, and were free to disorder the life of their hosts and insult their womankind as they thought fit. Men yielded to that sort of pressure who would not have yielded to rack and fire. The education of the next generation of Protestants was broken up, and the parents had to give Catholic instruction or none. They gave it, no doubt, with a sneer and an intonation that destroyed all faith in it. While more tolerant countries became mainly sincerely Catholic or sincerely Protestant, the persecuting countries, like France and Spain and Italy, so destroyed honest Protestant teaching that these peoples became mainly Catholic believers or Catholic atheists, ready to break out into blank atheism when ever the opportunity offered. The next reign, that of Louis XV, was the age of that supreme mocker, Voltaire (1694-1778), an age in which everybody in French society conformed to the Roman church and hardly anyone believed in it. It was part—and an excellent part—of the pose of Grand Monarchy to patronize literature and the sciences. Louis XIV set up an academy of sciences in rivalry with the English Royal Society of Charles II and the similar association at Florence. He decorated his court with poets, playwrights, philosophers, and scientific men. If the scientific process got little inspiration from this patronage, it did at any rate acquire resources for experiment and publication, and a certain prestige in the eyes of the vulgar. 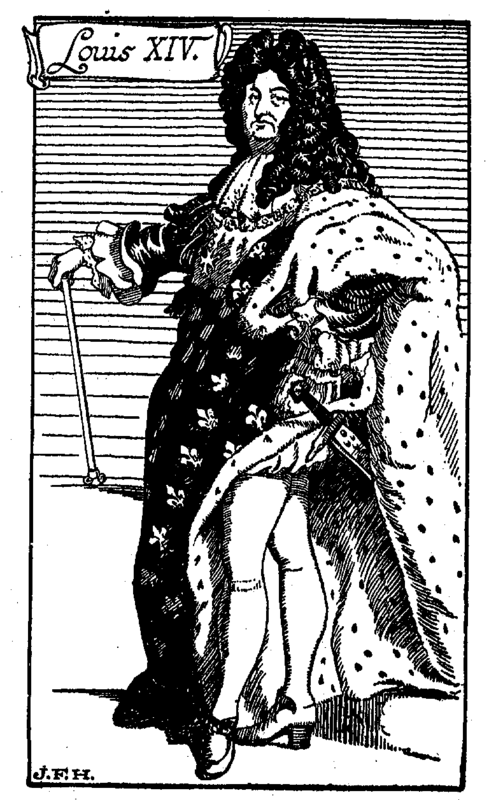 Louis XV was the great-grandson of Louis XIV, and an incompetent imitator of his predecessor’s magnificence. He posed as a king, but his ruling passion was that common obsession of our kind the pursuit of women, tempered by a superstitious fear of hell. How such women as the Duchess of Chateauroux, Madame de Pompadour, and Madame du Barry dominated the pleasures of the king, and how wars and alliances were made, provinces devastated, thousands of people killed, because of the vanities and spites of these creatures, and how all the public life of France and Europe was tainted with intrigue And prostitution and imposture because of them, the reader must learn from the memoirs of the time. The spirited foreign policy went on steadily under Louis XV towards its final smash. In 1774 this, Louis, Louis the Well-Beloved, as his flatterers, called him, died of smallpox, and was succeeded by his grandson, Louis XVI (1774-93), a dull, well-meaning man, an excellent shot, and an amateur locksmith of some ingenuity. Of how he came to follow Charles I to the scaffold we shall tell in a later section. Our present concern is with Grand Monarchy in the days of its glory. Among the chief practitioners of Grand Monarchy outside France we may no to first the Prussian kings, Frederick William I (1713-40), and his son and successor, Frederick II, Frederick the Great (1740-86). The story of the slow rise of the Hohenzollern family, which ruled the kingdom of Prussia, from inconspicuous beginnings is too tedious and unimportant for us to follow here. It is a story of luck and violence, of bold claims and sudden betrayals. It is told with great appreciation in Carlyle’s Frederick the Great. y the eighteenth century the Prussian kingdom was important enough to threaten the empire; it had a strong, well-drilled army, and its king was an attentive and worthy student of Machiavelli. Frederick the Great perfected his Versailles at Potsdam. There the park of Sans Souci, with its fountains, avenues, statuary, aped its model; there also was the New Palace, a vast brick building erected at enormous expense, the Orangery in the Italian style, with a collection of pictures, a Marble Palace, and so on. Frederick carried culture to the pitch of authorship, and corresponded with and entertained Voltaire, to their mutual exasperation. The Austrian dominions were kept too busy between the hammer of the French and the anvil of the Turks to develop the real Grand Monarch style until the reign of Maria Theresa (who, being a woman, did not bear the title of Empress) (1740-80). Joseph II, who was Emperor from 1765-92, succeeded to her palaces in 1780. With Peter the Great (1682-1725) the empire of Muscovy broke away from her Tartar traditions and entered the sphere of French attraction. Peter shaved the Oriental beards of his nobles and introduced Western costume. These were but the outward and visible symbols of his westerning tendencies. To release himself from the Asiatic feeling and traditions of Moscow, which, like Pekin, has a sacred inner city, the Kremlin, he built himself a new capital, Petrograd, upon the swamp of the Neva. And of course be built his Versailles, the Peterhof, about eighteen miles from this new Paris, employing a French architect and having a terrace, fountains, cascades, picture gallery, park, and all the recognized features. His more distinguished successors were Elizabeth (1741-62 ) and Catherine the Great, a German princess, who, after obtaining the crown in sound Oriental fashion through the murder of her husband, the legitimate Tsar, reverted to advanced Western ideals and ruled with great vigour from 1762 to 1796. She set up an academy, and corresponded with Voltaire. And she lived to witness the end of the system of Grand Monarchy in Europe and the execution of Louis XVI. We cannot even catalogue here the minor Grand Monarchs of the time in Florence (Tuscany) and Savoy and Saxony and Denmark and Sweden. Versailles, under a score of names, is starred in every volume of Bædeker, and the tourist gapes in their palaces. Nor can we deal with the war of the Spanish Succession. Spain, overstrained by the imperial enterprises of Charles V and Philip II, and enfeebled by a bigoted persecution of Protestants, Moslems, and Jews, was throughout the seventeenth and eighteenth centuries sinking down from her temporary importance in European affairs to the level of a secondary power again. These European monarchs ruled their kingdoms as their noblemen ruled their estates: they plotted against one another, they were politic and far seeing in an unreal fashion, they made wars, they spent the substance of Europe upon absurd «policies» of aggression and resistance. At last there burst upon them a great storm out of the depths. That storm, the First French Revolution, the indignation of the common man in Europe, took their system unawares. It was but the opening outbreak of a great cycle of political and social storms that still continue, that will perhaps continue until every vestige of nationalist monarchy has been swept out of the world and the skies clear again for the great peace of the federation of mankind.